Allah is the ALMIGHTY, no weakness can ever affect Him, no feebleness can ever affect His Self, his Attributes, or his Deeds. Qawey, which means mighty, is indicative of absolute power and ability; whensomeone is powerful he is said to be mighty. Quwah, which means might, can be used to denote concrete meanings, like mind, determination and volition. 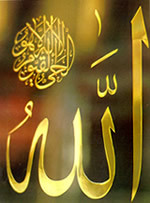 Allah says, “..then gave you strength after weakness, then after strength gave you weakness and a hoary head” (RUM, 54). It can also denote firm will, and power, “Hold firmly to what We have given you” (BAQARA, 63), and Gabriel was described by Allah in the Qur’an, “Verily this is the word of a most honourable Messenger. Endued with power, with rank before the Lord of the Throne.” (TAKWEER, 19, 20). The word quwah may also have various meanings of power, “He was taught by one, Mighty in Power.” (NAJM, 5), where nobody knows the meaning of that power, save Allah, the ALMIGHTY; the daughter of Shu‘ayb described Moses as being strong and mighty, aswas mentioned in the Qur’an, “..truly the best of men for thee toemploy is the man who is strong and trusty.” (QASSAS,26), and Allah, Praise and Glory be to Him, described himselfin the Qur’an as the ALMIGHTY in the verses, “..for thy Lord, Heis the Strong One, and Able to enforce His Will.” (HUD, 66), “..for verily God is Full of Strength, Exalted in Might, Able to enforce His Will.” (HAJJ, 40). If we contemplate all the created powers in the universe as gravity, electricity, chemical reactions, the power of gases, radiation such as laser and the like, we will perceive that the Creator of these sundry powers has a Power that we can not perfectly perceive. The essence of Allah’s Power cannot be known by a creature’s mentality. Glory be to the ALMIGHTY, He is Allah.